These babies are BRIGHT! 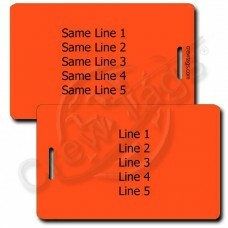 These Neon Orange luggage tags may not look real bright on the screen, but in person they will help you easily track down whatever you need to find. All of these Neon Orange Plastic Luggage Tags are printed with your own personal information directly on the tag.